For those familiar with the true Biblical account of Noah’s Arc, you know that the rainbow is a symbol of God’s promise to never flood the whole earth again. From the day Noah’s Arc landed on Mt. Ararat until now until forever, God’s promise remains. He will never flood the whole earth again. One evening, over a decade ago, my husband took me out for our anniversary dinner to a part of Montana called Paradise Valley. As we were driving into the valley, the setting sun was shining through the evening rain clouds, creating a double rainbow for all to admire. My longtime heart’s prayer was to have another baby, so I claimed that double rainbow as a double promise that God would bless us with a baby. Though there were three miscarriages and three heartbreaks in the years following, I clung to that promise. And God fulfilled His promise in His time by giving us Joel when I was 45 years old. We are so thankful for God’s promises. Today’s TEA CUPP: The next time you see a rainbow, claim all God’s promises!!! Write your favorite promises in your prayer journal today. Does your front entryway look like ours with a big pile of shoes? Shoes that are coming, shoes that are going, work shoes, play boots, running shoes for the motivated, old Crocs for taking out the trash, and slippers for relaxing. But most importantly, shoes to keep us on God’s path. How can shoes keep our feet on the straight and narrow? The best way is to start the day reading your Bible before you even put on your shoes! 1994 was the first year I read my Bible from start to finish, from Genesis to Revelation. I remember, because that was the year our little Jacob turned one. And every year since then, I continued to read God’s Word, some years reading a One Year Bible, broken up into daily readings. Other years, I’d read a regular Bible, while using a reading guide to mark off what I’d read. It was always easy starting out, for Genesis has the exciting stories of Creation, Adam and Eve, Noah and the Flood, Abraham, Isaac, Jacob and Joseph’s dreams. The momentum of those stories can carry your feet through Exodus where Moses leads God’s people out of Egypt. But when you reach Leviticus, things can slow down as you tip toe through the many laws laid out for the Israelites. That’s why I’m delighted when I find verses in Leviticus that God uses to inspire me. It’s a reward for the long pages of reading. But you have to read all the way to Leviticus 26 for today’s special promises! 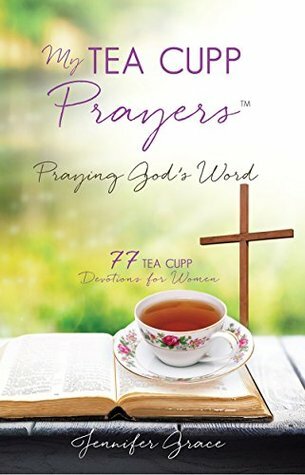 In My TEA CUPP Prayers (pp.98-99) I mention how God gives us calls with promises. If we do this call, God promises this promise. Here in Leviticus 26:3 we read a seemingly straight-forward call with amazing promises. God’s call is this: If you walk in My statutes and keep My commandments, and perform them. That’s it. We have to walk in His Word. Obey His commandments. And do what God tells us. Doesn’t sound too complicated, but as we all know, we can’t do it. For all have sinned and fall short of the glory of God (Romans 3:23). Even our best efforts, fall short of God’s glory. But because we have Jesus’ forgiveness, we are made righteous and can claim the promises that follow in Leviticus 26. Today’s TEA CUPP: Read Levitcus 26:1-13 and claim God’s wonderful promises as you have TEA with Jesus today. Then, when you put on your shoes, ask Jesus for His help in keeping on His path, and for His forgiveness when you fall short. Pray Psalm 25:4, Show me Your ways, O Lord; Teach me Your paths. Someone is Praying for You! Someone is praying for you, my friend! Someone is praying for you! I promise you that right now, someone is really and truly praying for you. I know what you are thinking, “Not me, why would anyone pray for me? You are mistaken.” But I promise you, it is true, someone is truly praying for you. 1) Jesus is praying for you! Can you believe it? It is true! Romans 8:34 promises us that Jesus is sitting at the right hand of God, making intercession for us. 2) Who else is praying for you? The Holy Spirit is praying for you! Even if we mess up our prayers and get it all wrong, the Holy Spirit is there, translating what our hearts really meant to the Father. Isn’t that good news?! You don’t have to pray just the “right” prayer. The Holy Spirit will take care of making it “just right” for God. The Spirit is praying for you! A recent example of this for me was when my Daddy was dying. I definitely didn’t have it all together as my voice cracked in tears. I was trying to pray the Lord’s Prayer over the phone with Daddy, as my sister held the phone to his ear. Somewhere around “debtors” or “temptations” I messed up, not remembering which version I was on…yet I know the Holy Spirit interceded at that very moment and heard our prayers and took my dear Daddy to heaven. For as soon as we ended the call, my sister texted, “He’s gone.” And there I sat on the sofa between my two boys, crying tears of sadness and joy, that God let us all be together in my Daddy’s final moments. I am spoiled. I live in South Central Montana where the scenery never ceases to be beautiful, where God’s creation forever proclaims His glory. And I get to see it all outside my morning window. As I sit on the sofa for TEA with Jesus each morning, I read my Bible, glancing out the window as I ponder His Word. There in the early morning light are God’s promises, echoing what I’ve read in His Word. Today’s TEA CUPP: Head outside for a nature walk today, looking for glimpses of God and praying as you walk. Oh, Jesus, You gave us this beautiful world to enjoy and to teach us about You. Thank You for Your wonderful promises in Your creation and in Your Word. I love You, Jesus!